We showed you one way to mount a Staghorn Fern to wood a while back and now we will show you a different, but much simpler method. There are always many paths to the same destination. This time we used a cedar mounting plaque, the same thing as a cedar orchid basket except it is flat. You could use any type of hardwood to mount the Staghorn Fern as softer woods tend to rot and you don’t want that for a strong mount. Soak your sphagnum moss in water and place it onto your mounting plaque about an inch deep. 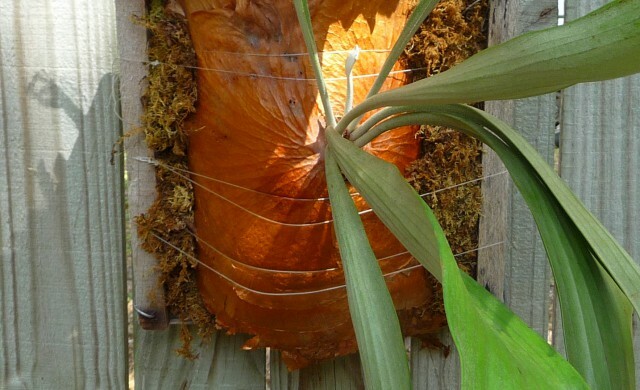 Not only will it help retain water and give you Staghorn Fern a nice cushion, but it also looks cool. 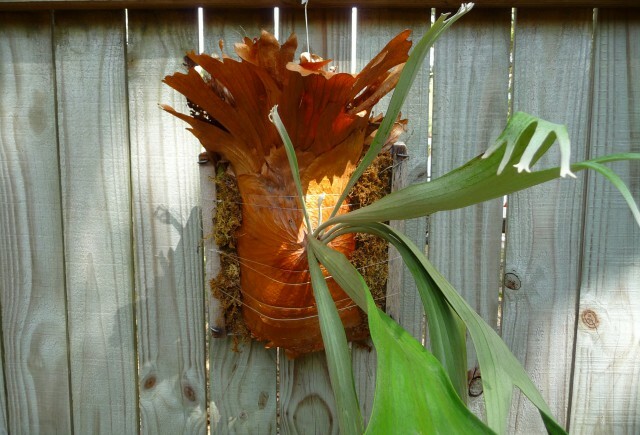 Place the Staghorn Fern on top of your mounting plaque and make sure to orient the fern which ever way pleases you – on a square or turn it on an angle to a diamond shape, either is good. Next comes the monofilament or fishing line. Fish line is strong, will not decay and is hard to see from a distance. It’s the most popular way to mount a plant. 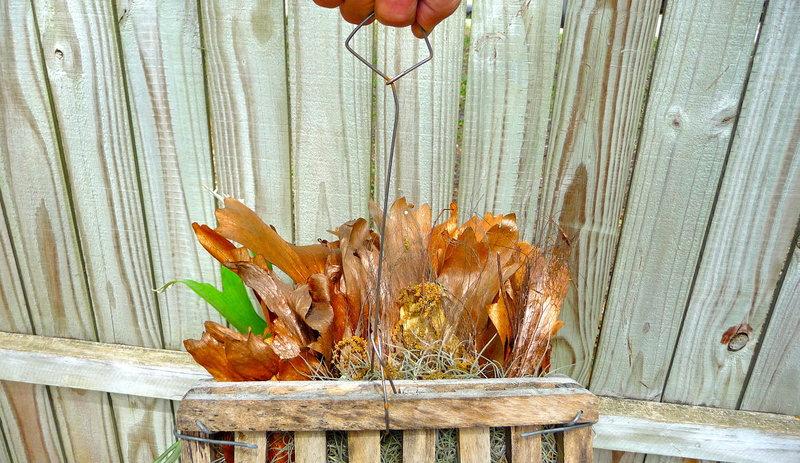 Tie one end to the mounting plaque and wrap it around the Staghorn Fern and the mount several times – maybe 5 to 10 times depending on the size. The more support, the less likely each individual strand of fish line will dig into your plant. It’s kind of like lying on a bed of nails …the more nails supporting your body, the less likely you will be pierced! I hope that makes sense. Tie off the end of your fish line and you are done. 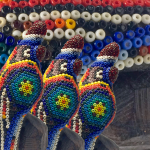 You can also tie each individual length of fish line separately so you have 5 to 10 individual tied off pieces in case one happens to break or gets chewed by a squirrel the whole thing won’t fall off. To hang it, we bent some heavy wire around the mount and made a loop at the top. Something like an old wire hanger could work too, you will just need some pliers to bend it. 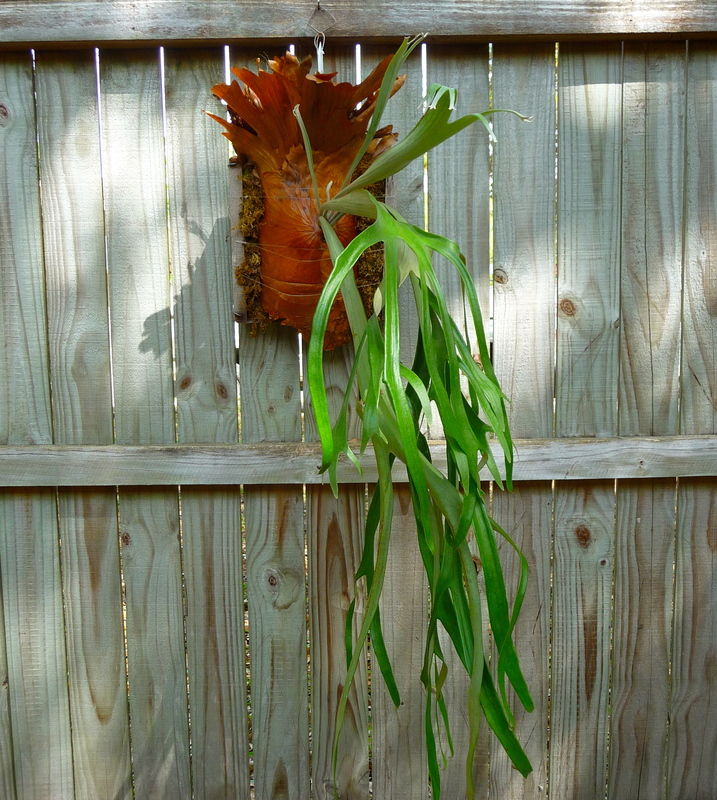 Now keep you Staghorn Fern in bright indirect light, like under a tree.